Grace Community Church’s “blue crew” is sweetening up the Maple City today for Valentine’s Day. Around the city, the blue crew — named because they wear bright blue sweatshirts and T-shirts with the church’s name on them — will randomly hand-deliver to people 5,000 1.55-ounce bars of Hershey chocolate. 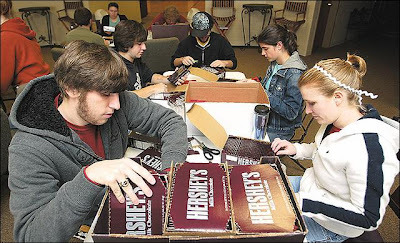 Crews were out this morning and will continue handing out Hershey bars from 2 to 4 p.m. and 7 to 9 p.m.
“There’s nothing quite like a delicious bar of chocolate, but that doesn’t begin to compare to what Jesus has to offer us and it’s all free,” said the Rev. Jim Brown, lead pastor at Grace Community Church. “Our theme this year at Grace is ‘raise the bar,’ and we are constantly trying to think outside the box as we reach out to people,” Brown said. A large group of college students will be involved with the blitz. “Having them onboard makes it really special,” Brown said. “We have a group of high school graduates from all over the country who are taking a year of intensive study for college credit right here at our church. They live with families in our church and take classes online through a Christian university. For more information about Grace, call 533-7546 or go to www.gracecommunity-church. com.